When make-up artist Linda Öhrström discovered that there is mercury in mascara, lead in lipstick and cadmium is a yellow pigment used in eyeshadows and powders – nasty stuff that destroys nature's ecosystems and disturbs our hormones and even can cause cancer it hit her on a very personal and emotional level. She I decided it was time for a big change. “Growing up and becoming an adult was something I wasn’t too excited about. I didn’t want a traditional kind of job. I just wanted to keep having fun! My interest in fashion was there from an early age and I’ve always loved working with my hands and touching different textures and colors. I was considering fashion design when I suddenly got the opportunity to assist a make-up artist. I was just gonna try it out for a laugh, and it was fun! Here I am 20 years later, still having as much fun and thinking I’ve got the best job in the world! I’m quite pleased that I found something that I really enjoyed doing at quite an early point in my life, and went for it. I had no idea what I was doing in the beginning, I was fully free-styling. I just did it and had fun doing it. At that time I was never wearing make-up. Because I didn’t want anyone to be able to judge my skills as a make-up artist by the way I painted my face. And I still don’t wear much. Well, I wear mascara at special occasions, but that’s about it. I actually don’t like wearing make-up and seldom did I try the products I was using on models, on myself. Until now, that is. About a year ago, I decided to detox my make-up bag and change all my products to organic, natural and sustainable alternatives. This decision came after a going through a major detox process which started with removing all of my many mercury fillings from my teeth. (I’ve been doing these sort of things for ages; raw food, green juices, colonics in the jungle, you name it). To make sure I was getting rid of all the toxins, I followed up with a week long deep cleanse and then retreated to Costa Rica for four months of surfing, yoga and a strict organic diet. I felt like the healthiest person on Earth when I got back, but after a check up at the doctor’s it turned out that my body was full of heavy metals such as lead, cadmium and mercury. I couldn’t believe it and took the test three times with the same result. I started to do research on the subject and stumbled upon Rose Mary Swift, the make-up artist and founder of organic beauty brand rms beauty, and it turned out we shared the same story. It was sort of a revelation and a wakeup call for me. I took a closer look at the products I’ve been using in my work for years and it turned out they’re all packed with harmful chemicals. There is mercury in mascara, lead in lipstick and cadmium is a yellow pigment used in eyeshadows and powders. Nasty stuff that destroys nature’s ecosystems, disturbs our hormones and even can cause cancer. This discovery hit me on a very personal and emotional level and I decided it was time for a big change. Looking back, I feel the timing couldn’t have been better. There are so many great green beauty brands on the market right now. I’m constantly trying new products and finding favorites worthy to replace the conventional cosmetics I was using before. My make-up kit is still not 100% organic. It will take some time to replace everything, especially since some of the products are not available in organic formulas yet. The goal is to continue doing make-up in my vibrant and colorful style, but to do it completely organic. That’s the philosophy behind The Organic Beauty project I’m doing for Volt Cafe. I want to wipe off peoples preconceived notions about organic beauty. It doesn’t have to be dull, beige and boring! For the first time in my life I’m actually doing make-up on myself, because I need to see how these natural pigments and potions performs on my skin. And I’m realizing how tricky it is! I often wish I could call Linda Öhrström and tell her to come and do my make-up! I’ve been working with Robyn, doing her make-up, for several years now. This summer I went on tour with her. We had a great, green time! She’s very health conscious, only organic fruit and vegetables in the lineup. 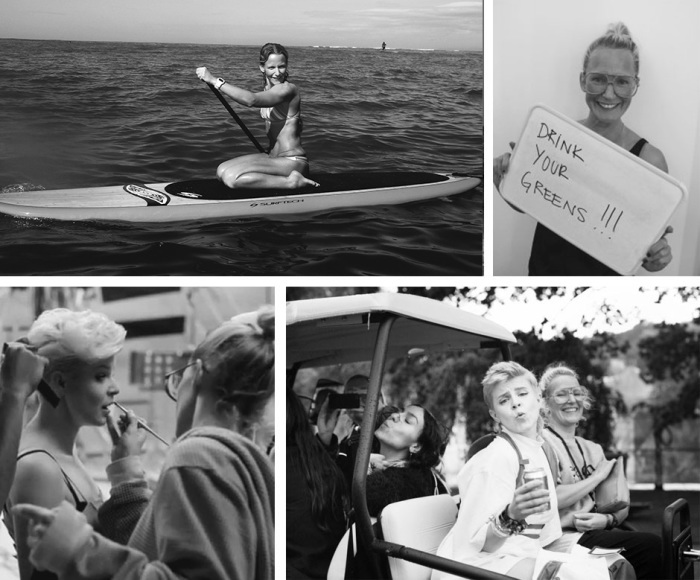 I’m providing the green juices and the occasional organic beauty sessions. Good times! She’s such a kind, honest and humble person. I’m happy I’ve been able to open up her consciousness when it comes to cosmetics. When I’m not doing make-up, I’m gone surfing, several months every year. I know it sounds like a cliché, but it is a lifestyle! Among my surf friends there is a strong sense of being one with nature and being aware of the environment. Why do people want to destroy the worlds most beautiful places? Why can’t people understand that everything we do to the nature will have consequences? Surfing also made me realize that a healthy lifestyle is what gives me the energy to get out on the board. To make progress I had to start taking better care of myself, and that’s how yoga and clean eating got into the picture. It’s all connected! For me, surfing is the biggest physical challenge, you can’t negotiate with mother nature! And you can’t pretend to be good at it, at least not when you’re out on the water. It takes 110% of commitment and you can’t think about anything else while you’re doing it. It’s the best metaphor for live; when you get wiped out and find yourself on the bottom of the sea, you’re the only one who can help yourself getting back up to the surface! – As told to Make It Last. Text: Filippa Berg. Linda Öhrström is a London-based make-up artist, beauty editor/consultant and organic cosmetics specialist. She’s a regular contributor to to a host of leading publications such as Vogue, Elle, Tatler, L’Officiel and Dazed & Confused. She’s also a favorite beautifier among celebrities such as Robyn, Neneh Cherry and Crown Princess Victoria of Sweden. Finishing Powder, Jurlique. Mascara, Rms beauty. Lipstick, Nudus. 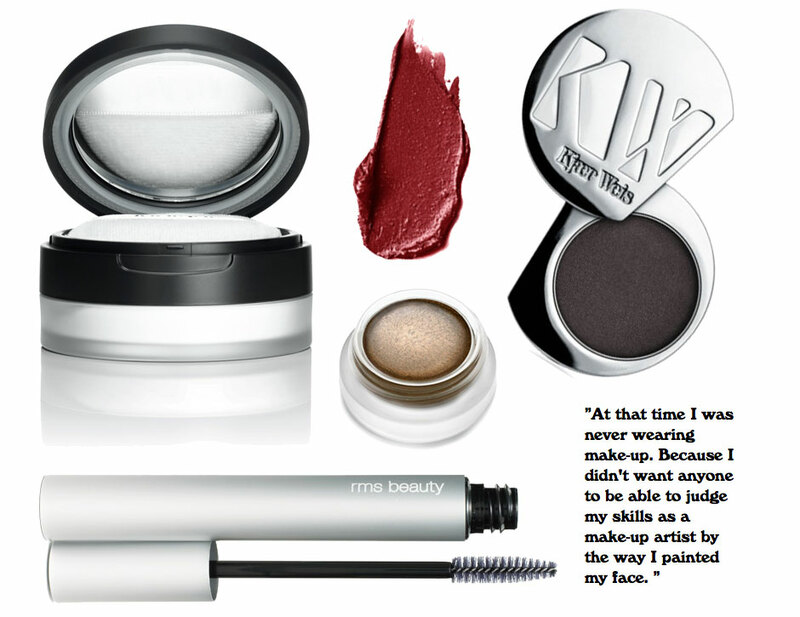 Cream eyeshadow, Rms beauty. Eyeshadow, Kjaer Weis.